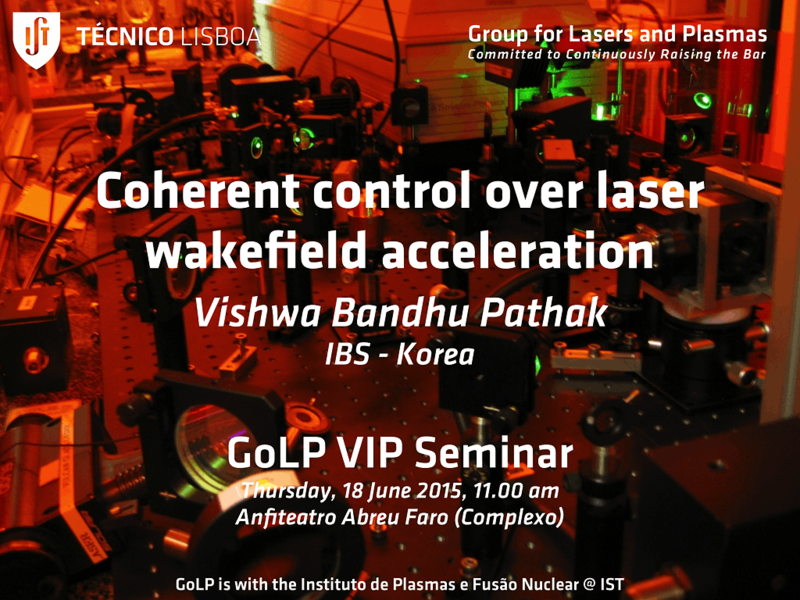 Bandhu Pathak, from CoReLS, IBS in Korea will give the GoLP VIP Seminar on June 18, 11am in Anfiteatro Abreu Faro (Complexo Interdisciplinar) on Coherent control over laser wakefield acceleration. One of the most promising applications of ultra high intensity laser systems is laser wakefield acceleration, with very exciting prospects to achieve the new energy frontier. In this talk we mainly discuss how modifying the spectral profile of the driving pulse can control the acceleration process. One of the ways of coherent control is by introducing frequency chirp in the laser which can affect the laser propagation, and as a consequence, on the wakefield acceleration. Laser chirp can affect the phase velocity of the wake, and the self-guiding conditions at the front of the laser. As a result the characteristics of the trapped electrons can be controlled using frequency chirp. We have then performed multi-dimensional simulations in Osiris, in order to explore all these possibilities also in connection with experiments recently performed at the CoReLS PW laser in Korea.